Syria is in a state of civil war. After the Arab Spring at the start of the decade, rebel forces took up arms against Bashar Al-Assad, the president of Syria. In a similar situation to Libya; several of the rebel groups are affiliated with or former branches of Al Qaeda. Libya’s own removal of their former leader, aided by the United States, has not turned out well for them. This same game played out in Iraq; US intervention to oust Saddam had catastrophic consequences on the country that led to the formation of ISIS. More bad than good comes out of America forcing a regime change in a middle eastern country. Any claim to protect the lives of the people by deposing a tyrant always leads to more deaths and instability than if we’d not intervened at all. Then there is the anti-imperialist argument, that we have no business intervening in other countries problems. Every country has the right to self determination; and by picking sides we are effectively installing our will on the country in defiance of what the people actually want. Certainly if people really believe that it is an outrage that Russia interfered in the US election they must also be equally outraged at our meddling and regime change in other countries? America must end its intervention with other countries. It rarely helps the people of those countries, and it certainly doesn’t help us. The cost in US lives, treasure, as well as the creation of new enemies targetting America certainly does not benefit us in any practical way. 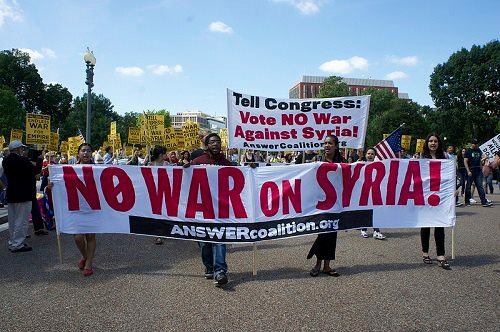 No Comment to " Opinion - Hands Off Syria "